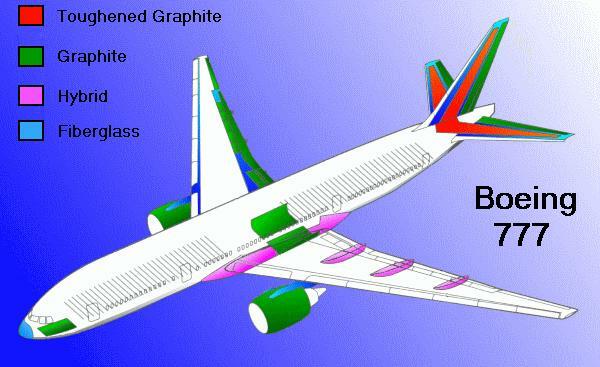 Various composite materials are used in structures such as the Boeing 777 because of their strength, and weight savings. Composites also offer resistance to fatigue, corrosion and impact damage. Composites are different from metals and are combinations of materials differing in composition or form. The constituents retain their identities in the composites, and do not dissolve or otherwise merge completely into each other, although they act together. Reinforced concrete is an excellent example of a composite structure in which the concrete and steel still retain their identities. The steel bars carry the tension loads, and the concrete carries the compression loads. In aircraft construction, the term composite structures refers to fabric resin combinations in which the fabric is embedded in the resin, but still retains its identity. Advanced composite materials consist of new high strength fibers embedded in an epoxy matrix. These composites provide for major weight savings in airplane structures, since they have high strength to weight ratios. When replacing aluminum structure with graphite/epoxy composite, weight reductions of 20% or better are possible. Weight reduction is the greatest advantage of composite material, and is one of the key items in decisions regarding its selection. Other advantages over conventional structure include, its high corrosion resistance, and its resistance to damage from cyclic loading (fatigue). The major disadvantage of using advanced composite materials in airplane construction is the relatively high cost of the materials. Composite Hybrids: Hybrids are made by the addition of some complementary material such as fiberglass or kevlar to the basic carbon fiber/epoxy matrix. The added materials are used to obtain specific material characteristics, such as greater fracture toughness and impact resistance, and should be considered for areas subject to foreign object damage. The addition of carbon / epoxy to fiberglass structure is used to provide additional stiffness.